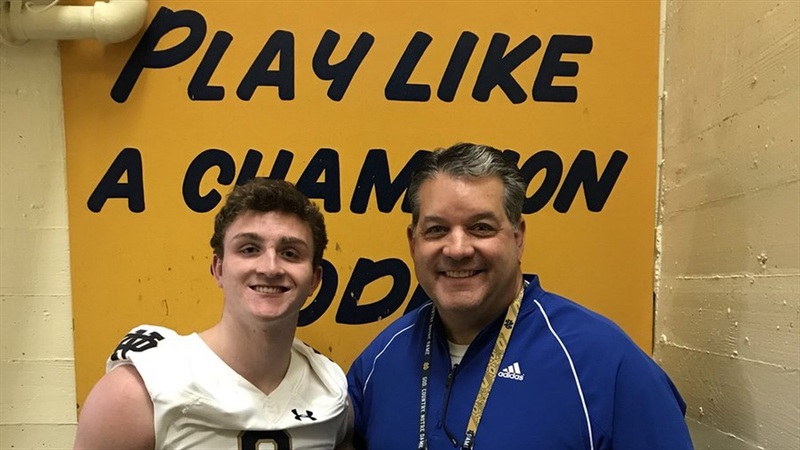 Liam Clifford‍ had been to Notre Dame before, but getting back on Saturday as a recruit on an unofficial visit was different. The St. Xavier High School standout started his day sitting in on a wide receivers meeting before practice. After lunch, the 6-foot-1, 190-pounder met with the strength staff and then had more time with wide receivers coach Del Alexander. “I was the only wide receiver up there, so it was just me and we went over the film from the practice they had earlier,” he said. “We watched film for about an hour, an hour and half, so that was pretty cool. Alexander encouraged Clifford, who has early offers from Michigan, Pittsburgh, Cincinnati and Toledo, to continue working hard. Clifford also noted the academic presentation as another “really impressive” part of the visit. He says he isn’t sure what’s next for him and Notre Dame as he doesn’t have his summer schedule mapped out yet. “I know they want me to go through the camp, so I’ll consider doing that, but I’ll have to figure all of that out,” he said. “I’d love to get back up on campus and bring my mom because she didn’t get to go up. It’d be good to have her see everything.